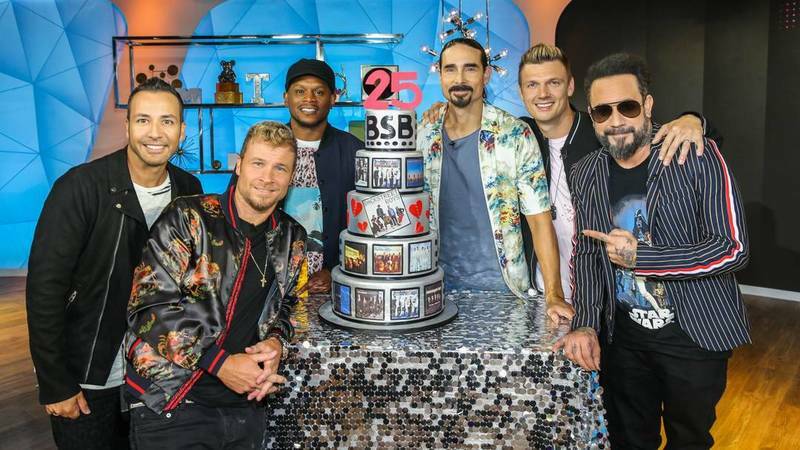 As quickly as “Don’t Go Breaking My Heart” has infiltrated the radio airwaves and multiple Top 40 charts, the Backstreet Boys have also started making multiple appearances in your home…. through the magic of television, that is. Last week, Kevin, Howie, Brian, AJ, and Nick made their first appearance on The Tonight Show since Jimmy Fallon has been hosting it in New York. No stranger to jamming with The Roots (remember that 2012 ‘Late Night’ performance? ), the Boys added Fallon to the mix this time, performing “I Want It That Way” with classroom instruments in a performance that immediately went viral. The video of the performance reached #5 most popular videos on YouTube throughout the following weekend. The goodness didn’t stop there. The Boys also ended the show on a high note (no pun intended) with a performance of “Don’t Go Breaking My Heart”, garnering lots of social media attention. “I am living! Can we please have the Backstreet Boys on every week,” a Twitter user wrote that night. If you missed the performances (or need an excuse to watch again), scroll down below! Less than six hours following The Tonight Show appearance, we time traveled back to the year 1999… or at least it seemed that way. The Backstreet Boys made their return to a new version of MTV’s TRL. While the show is no longer a countdown of music videos with Carson Daly, most 90s girls remember Sway, who interviewed Kevin, Howie, Brian, AJ and Nick for the entire half hour, reliving the moments that made some of the greatest TV in BSB history, even bringing back fans who formerly appeared with the guys! ...And creating new memories for some VERY lucky, unsuspecting fans who got “trapped” in an elevator with all five Backstreet Boys. Watch it all go down right here. Don’t forget to watch the Boys rock Central Park on Good Morning America next Friday, July 13th on ABC! Check your local listings for times.